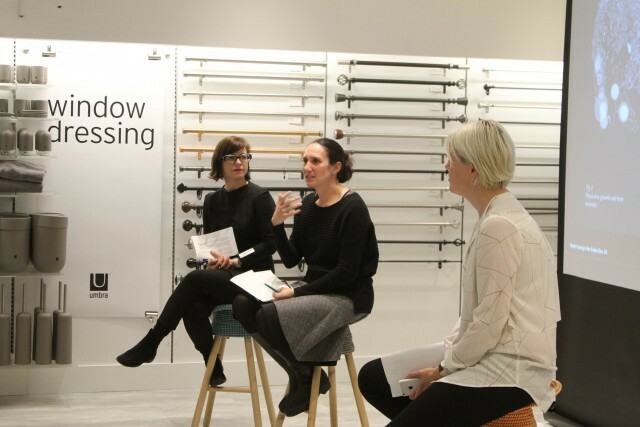 On Tuesday night over 50 participants gathered at the Umbra Concept Store for the third session of Exporting Toronto Design: ‘At Home and Abroad’. Though the rainy weather led to a late start to the evening, we were soon up and running. 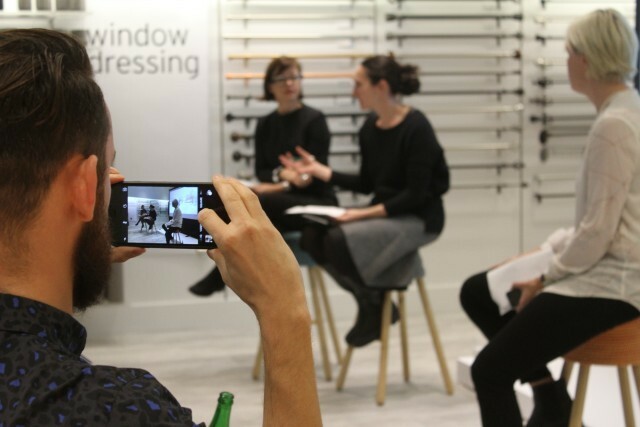 We began with a discussion led by Lateral Office’s Lola Sheppard and Azure Magazine’s Catherine Osborne on the Toronto Design scene and its potential for expansion into an international arena. The ladies spoke together against a slideshow of their various works, and took questions from the audience throughout. The discussion featured a variety of topics including the balance between being a problem solver and a designer, the importance of being able to articulate the story behind a design, and the necessity of being able to say no to projects that don’t inspire you. Lola and Catherine also focused on the importance of taking risks, and how valuable competitions can be for a designer, regardless of the outcome. They drew from their personal experiences in their respective fields of design and architecture, and gave the audience some amazing insights into the world and mind of a designer. 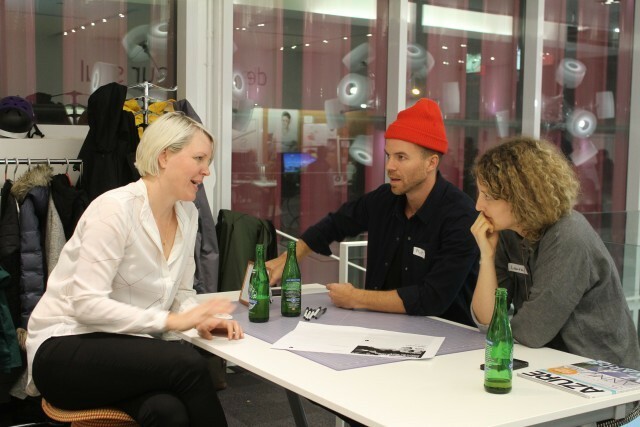 After the presentation, participants were divided up into groups to workshop ideas that had been brainstormed in Exporting Toronto Design’s previous session, ‘Collaboration’. Led by TO DO’s Simon Mhanna, participants were asked to design a project or process to solve a certain problem within the design community. These included challenges such as imagining Toronto as a museum to share and display design work, building a network to connect the fields of design and business, and creating an online resource to showcase the best design work and stories. While some groups struggled with the task, others came up with some innovative and potentially actionable ideas. 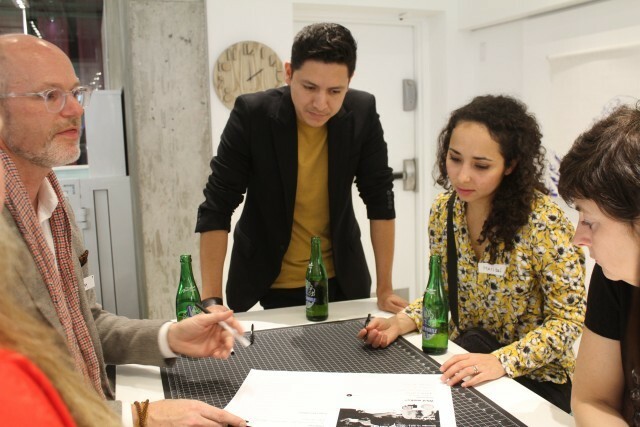 Special thanks to our hosts at the gorgeous Umbra Concept Store who were more than accommodating and helpful all night, and to Steamwhistle who generously provided drinks to keep our guests happy throughout the evening. We look forward to seeing all our participants at the festival this upcoming January.